The SVGEF awarded a grant to two people from Barrouallie to start up wildlife tourism businesses, including whale and dolphin watching. Kirk Grant: a tourism guide and fisherman from Barrouallie, who is strongly supportive of his community’s transition from whaling to whale watching. 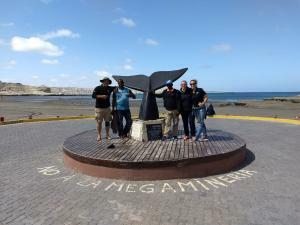 In order to ensure that the men were trained in the principles of responsible wildlife tour operations, the first part of the grant was a ten day trip to the whale watching capital of the world: Patagonia, Argentina. In Argentina they were hosted by Funcacion Cethus who conducted workshops and hosted the gentlemen. 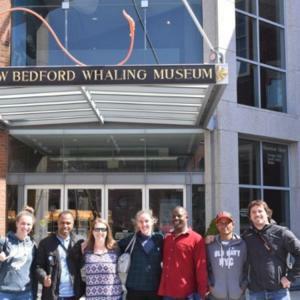 The five day workshop taught the participants the principles and practice of responsible cetacean-watching as well as basic cetacean biology. 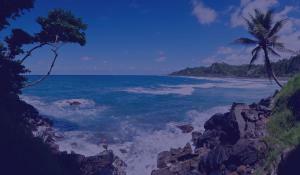 It provided them with essential knowledge required to develop, run and promote a sustainable and popular eco-tourism activity that has the potential to bring significant economic and employment opportunities to their community. Lennox and Kirk attended presentations about various subjects: the biology of the cetaceans of Saint Vincent; the characteristics of mammals, and differences between whales and dolphins; the principles of responsible eco tourism, as well as basic business management and different possible components to a tour. 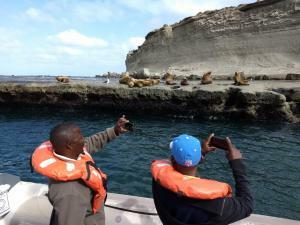 They were taken on many wildlife tours, where they saw dolphins, sea lions, penguins and many other fauna of Patagonia. 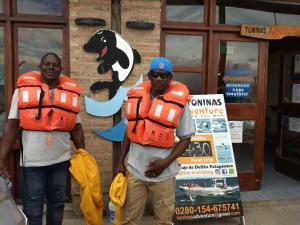 After returning to St. Vincent and the Grenadines, trained in responsible wildlife tour operations, Lennox and Kirk will obtain assistance from the SVGEF to get set up. For Lennox this means new equipment for his boat (a boat he originally hand crafted), and for Kirk this means a new boat. In a press conference in St. Vincent, Lennox said that he had decided to give up whaling to explore this business of doing wildlife tours instead as he saw that over the years he has seen the numbers of whales and dolphins decreasing. Lennox is the first whaler from the whaling town of Barrouallie to give up whaling to go into eco-tourism. The men will launch their boats and their businesses at the end of April 2019. This project was co-sponsored by the Yanagil Education and Development Fund, a Fund founded by Vincentians Gilbert and Iyana Weekes.